The Bobcat Chronicle: Research in the Shetland Islands! Research in the Shetland Islands! On Tuesday May 24th I took off from the Logan Airport and flew to the Shetland Islands. The trip took about 24 hours after going through Paris and Edinburgh. My fellow Batesie, Jen Lindelof, and I arrived on Wednesday, joining our advisors and fellow research team in Sumburgh, located on the Southern coast of Shetland. Over the course of two weeks, I did the field work of collecting samples of shells for my summer research, and for my thesis work back at Bates. 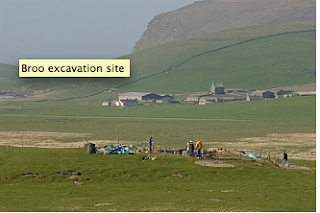 This was part of the Shetland Islands Climate and Settlement Project being funded by the National Science Foundation. A group of archaeologists, geologists, and biologists are conducting research on a site in Shetland called the Broo Site. This site was once a farm homestead in the late 1600's and early 1700's, before being covered up by sand blow up from the ocean . A Bates short term team began excavating the site during the month of May. Our team of reserachers replaced them and have taken up where they left off. My main focus of the project is to use clams and other mollusc shells from the archaeological site and from modern day beaches to determine their ages and growth rates. My research will look at the growth lines bivavles lay down in their shells (very similar to tree rings), as well as mineral and isotope composition of the shells. By comparing archaeological shells to shells from modern species, you can determine the difference in growth and composition of the shells related to changes in the environmental conditions of the area. This information, along with the geological and archaeological information, can be combined to determine the environmental conditions of the area back in the 1600's before the sand dunes covered the area. recommend a trip to see the Shetland Islands to anyone! Great story by Amy Johnston! We enjoyed reading it, and seeing the nice pictures!